Campaigns | Tim Bagwell, SMC, Ph.D.
Dr. Tim Bagwell 10/29/2008 Principia College, Elsah, Illinois. Dr. Bagwell was a candidate for the United States Congress, Illinois 19th Congressional District in 2004 (94,503 votes) and 2010 (67,132 votes). Pictured at right is Dr. Bagwell during his campaign debate at Principia College at Elsah, Illinois. Bagwell organized and recruited Richardson for President state delegates in Illinois in 2007 and 2008 and was a precinct organizer in Iowa in 2007-2008. Bagwell organized and setup the Clinton Campaign Headquarters in Terre Haute, Indiana during the 2008 primary election. Bagwell was also an elected delegate to the Indiana Democratic state convention in 2008, elected from Honey Creek Township, Vigo County, Indiana. 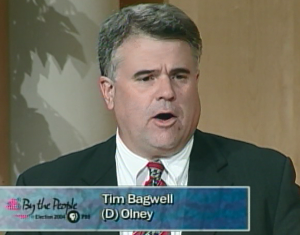 Bagwell was a member of the Americans for Democratic Action (ADA) endorsement committee, endorsing Obama in 2008.